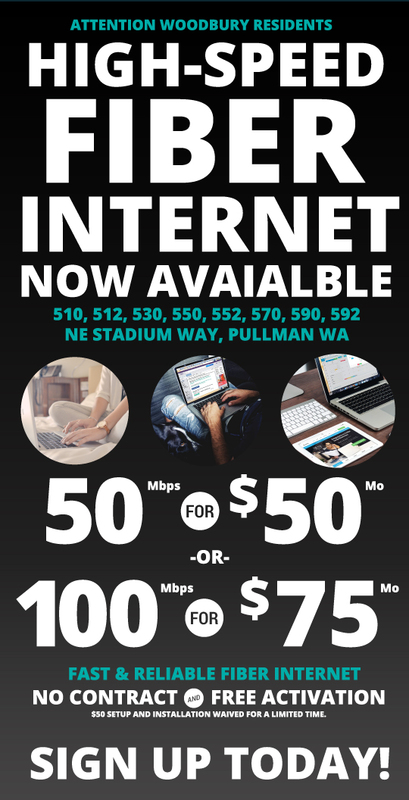 *Service only available at the 510, 512, 530, 532, 550, 552, 570, 572, 590, 592 NE Stadium Way, Pullman WA apartments at this time. Setup includes a wireless router that is installed inside the apartment. Wireless coverage from FSI provided wireless router inside the apartment is not guaranteed. Customer can run, at their own expense, ethernet cable from FSI provided wireless router to customer equipment inside apartment (i.e. switch, game console, smart TV, etc.). All equipment must be returned when service is terminated.